I have forty minutes alone before I have to be back home with my kids. 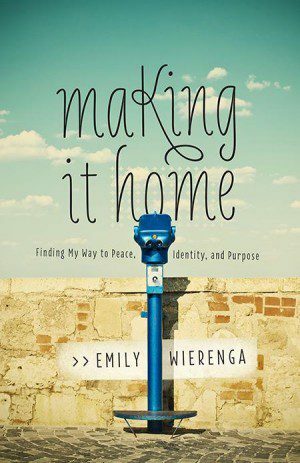 I came here to write this post that I promised Emily Wierenga, celebrating the launch of her beautiful new memoir, Making it Home: Finding My Way to Peace, Identity and Purpose. I sit in my corner booth next to the wall of windows, and I wonder how I can express the key peace, purpose and identity in the next half an hour. How can I do justice to so great a theme? I think about my own heart wrestlings through these issues, my quest for a heart occupied by peace, fully content with its purpose. I thought about this for a while, and realized I’ve felt the same way. While her primary roles at that time were as a wife and mother, that wasn’t all that defined who my friend was as a person. I’m a mother of three — but that’s not all that defines me. I’m an adoptive mom — but that’s not the only thing I am. I’m a homeschooler — but I am not my job title. I’m a pastor’s wife — but my purpose isn’t found solely in my position. I have brown hair and hazel eyes — but my reflection in the mirror doesn’t reflect my heart. The thing is, these so-called “labels” I’ve listed above might contribute to my sense of identity, but they don’t dictate my soul. They’re not the core of who I am. More than that, they could all be snatched away in a heartbeat. My children could die, my spouse could pass away, my kids might be sent to school, my husband might change jobs. My hair that used to be dirty blonde is gradually going gray — and I’m not even 35. If my family were taken away or my hair all fell out — would my identity be taken away as well? Would my purpose in life dissolve? I think about the world today. We live in an era where identities can be changed, stolen, compromised. How do we think about these things and not be discouraged? The answer lies in a place far deeper than any gender surgery or identity theft hacker can reach. I have a friend who has recently retired, and one who has recently graduated. They’re both squinting their eyes, navigating through a hazy windshield, unsure what lies ahead around the next bend in the road. While these next few months may feel frustrating in the land of in between, my friends’ identities have not changed. They both belong to Christ. Yes, they are now called “graduate” and “retiree,” but far above these earthly labels, they are His. Motherhood is not my tagline. Neither is my marriage, my job, my hair, or my house. My tagline is found in the One who calls me His own. By grace alone, I am my beloved’s, and He is mine. Jesus is my tagline — and so much more. He is my peace, my purpose, my identity. He is the One who will help me make it home. Emily Wierenga’s writing is truly beautiful, friends. In fact, beautiful is an insufficient adjective. Her voice carries me. She inspires me to strive toward bettering myself in the craft. 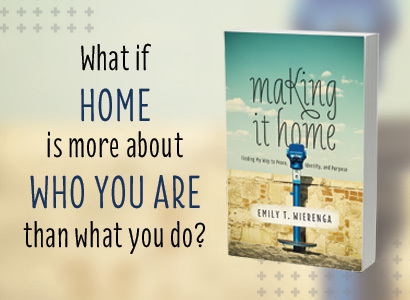 Her latest book, Making It Home: Finding My Way to Peace, Identity and Purpose is now available. It’s a companion to her first memoir, Atlas Girl. For more book recommendations, click here. I’m so glad to hear that it was a blessing, Helen! Thank you for taking the time to read and comment.